Clear acrylic handheld double sided mirror with a 10X/1X magnification 5.5"
10x/1x Magnification Double-Sided Clear Acrylic Hand Mirror. 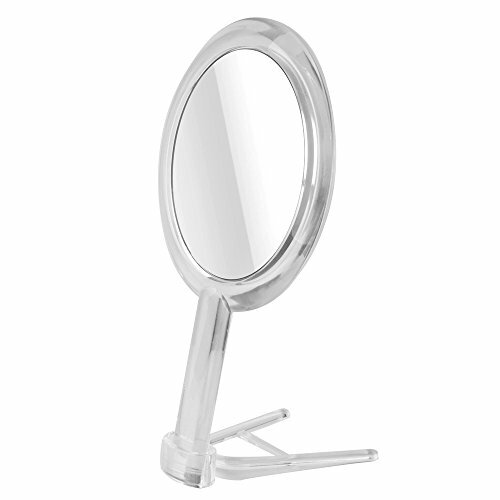 This handheld Double sided mirror features an 7X distortion free glass on one side and 1x reverse side, plus the included stand allows for hands free use of the 5-inch size mirror, which allows you to see the tiniest detail. Reveal your beauty to yourself with Gotofine Handheld Mirror. This mirror looks extremely elegant and has a beautiful glossy finish. The classic shape makes it look even prettier. 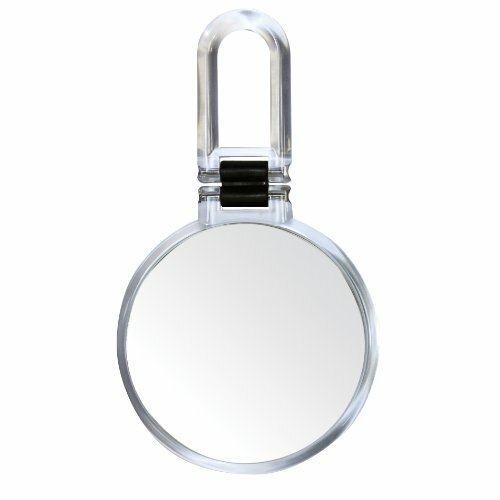 -Classic shape -Double Sided- 1X & 7X Magnification -Handheld & Stand -Portable A mirror is the true reflection of beauty. Most people overlook the fact that a good, high quality mirror is one of the most important beauty tools that you can have. If we lived in a world without mirrors, everyone would be walking around with lip stick on their upper lip or mascara on their eyebrows. When it comes to beauty, a mirror is your BFF. All Gotofine mirrors are precision made of the highest quality optical glass. Aesthetically appealing, functional and suitable for a variety of needs. 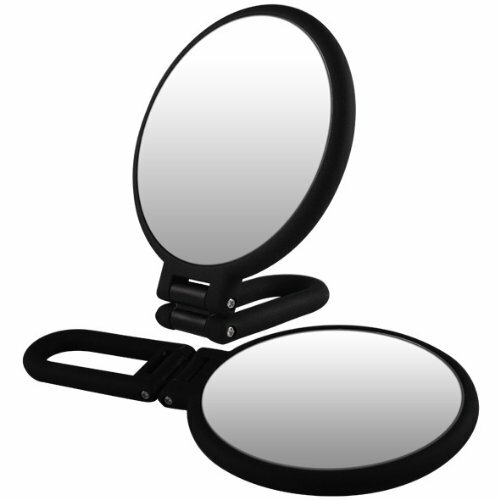 Providing both regular and magnified vision capabilities ranging from 3 to 20 times magnification, Gotofine mirrors come in a variety of styles including countertop, wall mounted, handheld and suction. A mirror is the true reflection of beauty. Most people overlook the fact that a good, high quality mirror is one of the most important beauty tools that you can have. If we lived in a world without mirrors, everyone would be walking around with lip stick on their upper lip or mascara on their eyebrows. When it comes to beauty, a mirror is your BFF. Make a statement of style with the latest collection of cosmetic mirrors and purse accessories from Danielle by upper Canada. With an extensive range of finishes and details, Danielle mirrors complement any home decor while providing a wide range of magnification to provide optimal precision for all grooming needs. All Danielle mirrors are precisionmade of the highest quality optical glass. Aesthetically appealing, functional and suitable for a variety of needs. 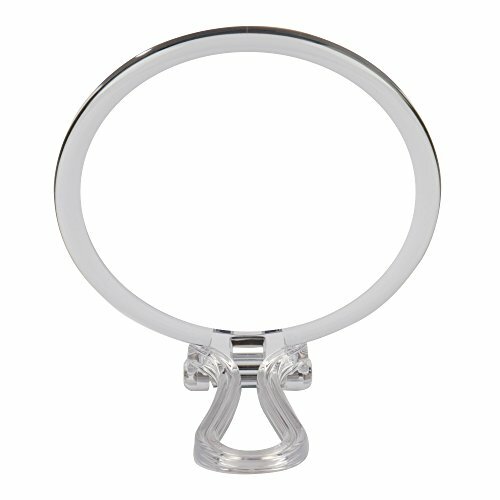 Providing both regular and magnified vision capabilities ranging from 3 to 12 times magnification, Danielle mirrors come in a variety of styles including countertop, wallmounted, handheld and suction. For over 45 years, Danielle has been a wellknown and a highly respected entity in the personal care industry, with quality and good value as a driving factor in the development of their products. 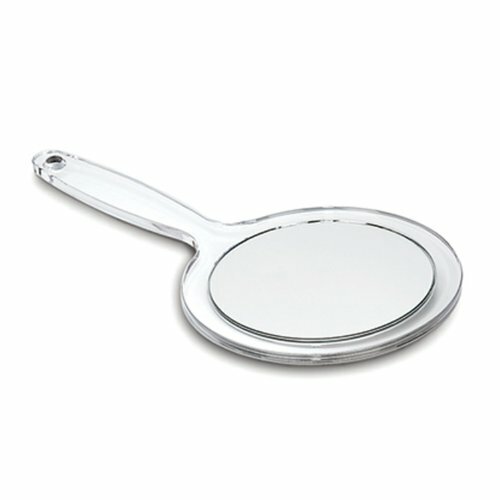 Hand mirrors show patients their treatment needs, clean smiles. 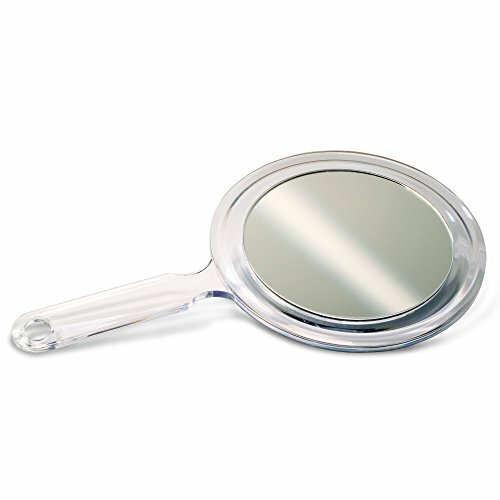 Two-sided Acrylic Hand Mirror has 3X magnifying and plain glass sides. 5" diameter glass with translucent handle. 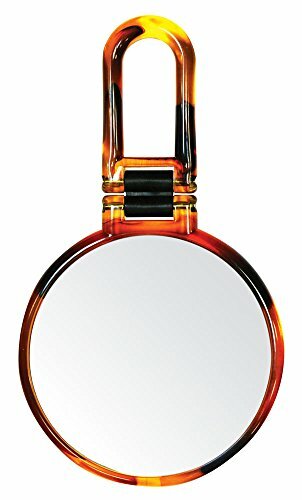 The Miss Sweet Hand Held mirror comes with a 6-month limited warranty that protects against any defects due to faulty material or workmanship.It with true image and 10X magnification.This mirror is also great for travelling. When you want the best in stationery and giftware, trust C.R. Gibson, synonymous with quality for more than 140 years. Starting with the creation of the very first baby book in 1898, families around the world have depended on C.R. Gibson as their number one provider of products that celebrate life's most cherished moments. Today you'll not only find baby books and photo albums, you'll also find a wide choice of party supplies, gift ideas, and little luxuries to make your life easier and more colorful. Understanding the importance of design and craftsmanship, all C.R. Gibson products offer a tradition of quality in products that highlight classic styling as well as today's top fashions. 10x/Normal View Soft Touch Foldable/Handheld Mirror. 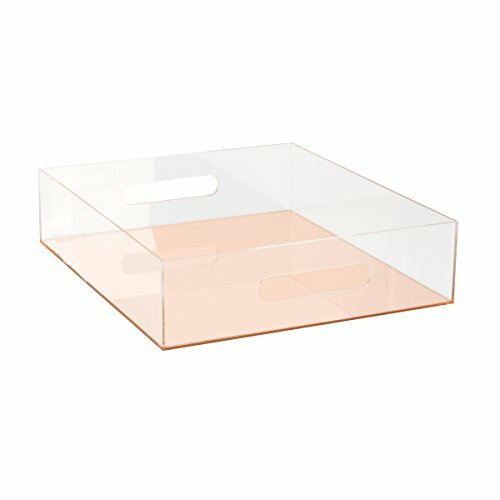 Looking for more Clear Acrylic Mirror similar ideas? Try to explore these searches: Amethyst Pendant 18' Chain, Cleaning Glass, and Country Solomon Islands. Look at latest related video about Clear Acrylic Mirror. Shopwizion.com is the smartest way for online shopping: compare prices of leading online shops for best deals around the web. 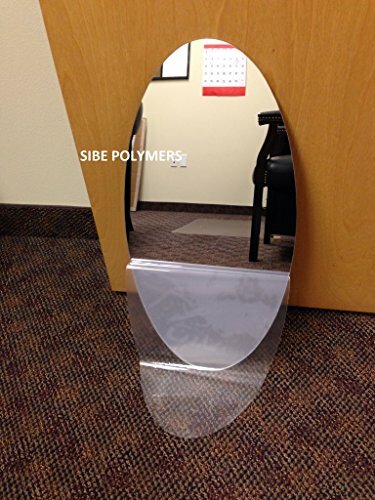 Don't miss TOP Clear Acrylic Mirror deals, updated daily.